There is something magical happening in the wilds of western Vancouver island, the Otalith Music Festival. It’s rare to have such a well curated yet organic feeling music festival, but they’ve certainly done it with Otalith. Their band music selection blends perfectly with the surrounding wilderness and laid back atmosphere of the surrounding communities. For the second year of the growing festival the organizers decided to add a second stage at Tofino Brew Co. for the locals who couldn’t quite make to Ucluelet’s main festival grounds. Here you could find the freshest beer the brewery had to offer on tap. Including their Spruce Tree Ale and seasonal beer, Fogust. Paperboy hammered out a White Stripes cover with more passion than Jack White while dressed as matching old-timey paper boys. They even had bow ties for sale at the merch table. 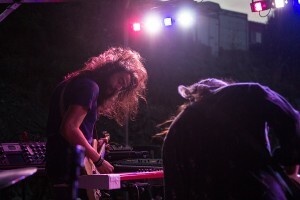 Austin’s Bright Light Social Hour headlined with an evening of festivities at the brewery with an arguably more intimate and energetic performance than Rock The Shores. The 250-300 people in attendance of that set were certainly in for a rare treat when it comes to live music. 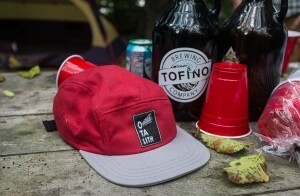 When the brewery wound down folks headed to Tofino’s Coho Room for DJ sets or raced to catch the headliners Dear Rouge and Bear Mountain at the festival grounds in Ucluelet. As the night ended the party atmosphere followed the plethora of people camping at the nearby Ucluelet Campground. Bands and friends joined in the after parties, campfires, s’mores, and keggers. while It was certain that festival goers didn’t want the fun to end. The second day of the festival started off slowly for some after the parties from the night before, but all it took was the wafting smell of pulled pork from the food vendors to lure everyone back. Jon Middleton fresh from Roy’s wedding (his music partner in their band Jon & Roy) filled the festival grounds with his brand of west coast folk reminiscent of days spent on the beach around a fire waiting for that big wave. Jon Middleton is certainly a favourite on Vancouver Island for his unique voice and west coast vibes. Throughout the day the word “bestival” was thrown around by first time Otalith Festival goers who had never experienced a music festival like this before. Before entering the grounds you knew it was relaxed and family friendly. 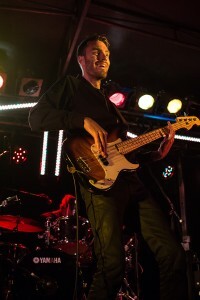 Victorian indie rock bands like Freedom Pony and Carmanah stood out with larger than life sounds. Both bands have grown more confident with their craft over the last year, and it shows. The choral pop sounds of Portland’s Ages & Ages floated through the air effortlessly like the fog that had rested over the grounds earlier in the day. Children and adults danced at the front of the stage as the sun went down on the final day of the festival. 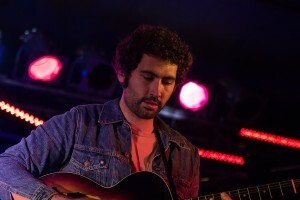 Headliners, The Allah-Las sound is reminiscent of a different time. A psychedelic shoegaze pop that is deep and meaningful in the vein of The Yardbirds or The Zombies. There was no better way to close down this year’s festival than watching this talented band perform in such a beautiful setting. After an amazing Allah-Las set the festival organizers came out to a cheering crowd to take a bow. It’s worth noting that all the organizers volunteer their time to put Otalith together and that they donate the proceeds to three local charities at the end of the festival. With well curated sights and sounds it is clear that the Otalith Music Festival is here to stay and ready to put their mark on the map as Vancouver Island’s premiere destination festival.